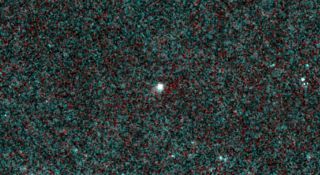 NASA's NEOWISE mission captured images of comet C/2013 A1 Siding Spring, which is slated to make a close pass by Mars on Oct. 19, 2014. The infrared pictures reveal a comet that is active and very dusty even though it was about 355 million miles (571 million kilometers) away from the sun on Jan. 16, 2014, when this picture was taken. NASA is keeping a keen and cautious eye on a comet that will have a close encounter with Mars in October, coming much closer to the Red Planet than the moon is to Earth. Comet Siding Spring will approach within 86,000 miles (138,000 kilometers) of Mars on Oct. 19, potentially putting on a good show for NASA's Red Planet spacecraft. But the dust shed by the comet as it barrels toward the sun may also endanger the agency's Mars orbiters, so officials are already mapping out possible risk-mitigation plans. Comet Siding Spring, which was discovered in January 2013, is making its first trip through the inner solar system from the Oort Cloud, a frigid comet repository on the far outer reaches of the solar system. It won't make another such visit for a million years or so. Some NASA spacecraft have begun studying Siding Spring, which is currently about three-fourths as far from the sun as Jupiter is. For example, recent observations by the agency's asteroid-hunting NEOWISE space telescope show that the comet's nucleus is already expelling significant amounts of dust, officials said. NASA's Mars missions will join the observation campaign when Siding Spring gets closer to the Red Planet. For example, the Mars Reconnaissance Orbiter (MRO) may get good images of the comet's core during the close approach. This graphic depicts the orbit of comet C/2013 A1 Siding Spring as it swings around the sun in 2014. On Oct. 19, the comet will have a very close pass at Mars, just 86,000 miles (138,000 kilometers) from the planet. Although the nucleus will miss the planet, the comet's coma of dust particles might envelop the Red Planet. "We could learn about the nucleus — its shape, its rotation, whether some areas on its surface are darker than others," Zurek said. MRO and another NASA orbiter, Mars Odyssey, may also use their infrared sensors to see what effect, if any, the comet's infalling dust has on the Martian atmosphere, Zurek added. Meanwhile, on the Red Planet's surface, the agency's Opportunity and Curiosity rovers will likely crane their necks up to look for meteors caused by particles in the comet's tail. However, most of these meteors will likely occur during the daytime rather than at night, making them tougher for the six-wheeled robots to see, researchers said. Scientists got some practice recently observing a comet's flyby of Mars. In early October, the much-hyped Comet ISON passed within 6.5 million miles (10.4 million km) of the Red Planet on the way toward its close encounter with the sun on Nov. 28. While NASA officials are excited about the scientific opportunities presented by Siding Spring's Marsflyby, they're a bit nervous as well. If the comet's nucleus sheds a great deal of dust, the agency's Red Planet orbiters could be at risk. Because Siding Spring is traveling in pretty much the opposite direction of Mars and the other planets, its nucleus and any shed dust particles will be moving at a tremendous speed relative to NASA's Red Planet orbiters — about 126,000 mph (203,000 km/h), officials said. But it's still too early to know just how much of a threat Siding Spring poses. The picture will start getting clearer this spring, as the comet passes the solar system's "snow line" — the distance from the sun at which water ice readily sublimes into gas, freeing lots of dust particles. "How active will Siding Spring be in April and May? We'll be watching that," said JPL's Soren Madsen, Mars Exploration Program chief engineer. "But if the red alarm starts sounding in May, it would be too late to start planning how to respond. That's why we're doing what we're doing right now." If the risk is determined to be high, the orbiters' handlers may try to get them behind Mars during the times of peak danger and/or orient the spacecraft to protect their most vulnerable parts, officials said. Engineers aren't worried about Opportunity and Curiosity. While Mars' atmosphere is just 1 percent as thick as that of Earth, it's still substantial enough to prevent comet dust from making it all the way down to the Red Planet's surface.